Our themed baths have become one of my kids most anticipated activities. Today’s theme was O Christmas Tree! 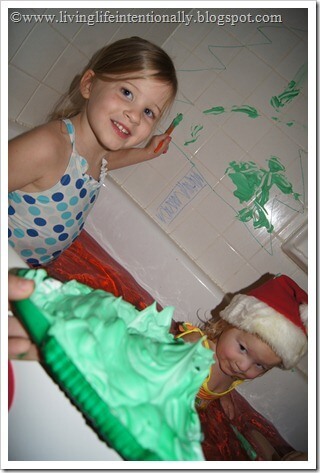 Here is our Christmas Bath. 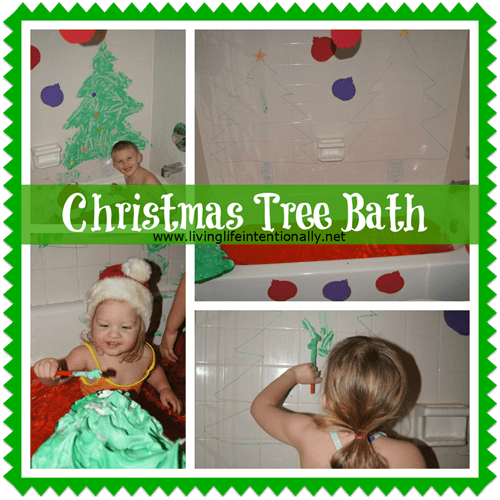 This O Christmas Tree Bath is simple to set-up, but loads of fun. Your kids may want to stay in the bath all day! I set the stage by hanging foam ornaments from the curtain rod and sticking on the bath walls (just get the back wet & they will stick – like magic =-) I bought a huge pack of precut holiday ornaments at the Target dollar section! 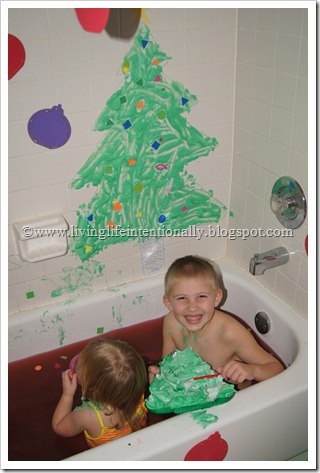 Then I traced the outline of two Christmas trees with bath crayons on the wall complete with a trunk at the bottom and a tree at the top. 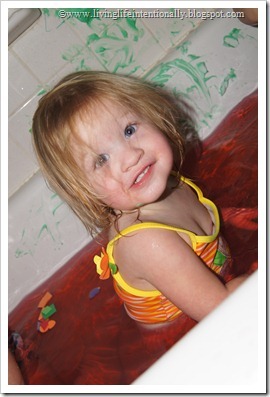 And I tinted the bathwater red. Next came the fun part. The kids got to paint the Christmas tree! 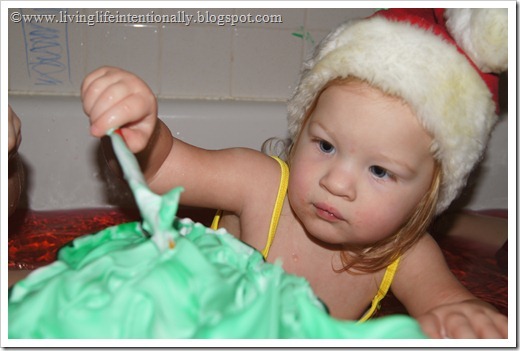 To paint the trees I mixed shaving cream and a couple drops of food coloring in a Christmas Tree plastic tray I had bought on clearance at Wal-Mart for $0.50. If I had been planning a little better I would have added a drop or two of wintergreen essential oil to the green ‘paint’ to add some tree scent. NOTE: Remember to always test a small amount on your walls to ensure it will come off and on your children’s skin to ensure the shaving cream doesn’t bother sensitive skin. 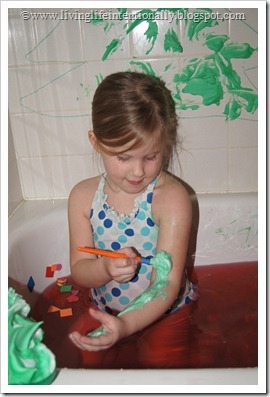 Then the kids painted themselves and played in their red water. It was a great sensory experience and fun way to play during December. 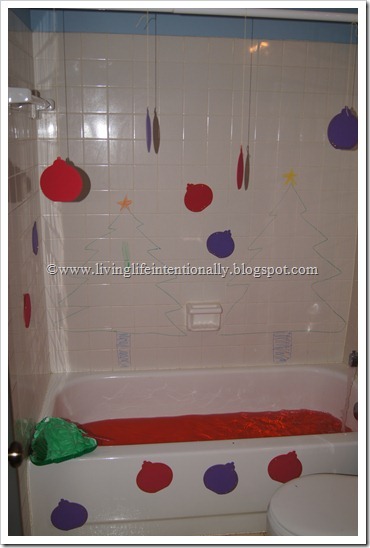 Have you tried themed baths with your kids? If so what’s been your favorite?